Street Feast: Sunday June 23rd, 2013. Will You Be Getting Involved? But we live in a busy apartment block and we rarely seem to cross paths. And lest you think we're hermits, Mr Fluff and I are not alone. A recent survey carried out by Centra - to mark the launch of Street Feast 2013 - found that three quarters of people either didn't know their neighbours at all, or knew them just enough to say hello. Hey look, it's Deryck! Hi Deryck! 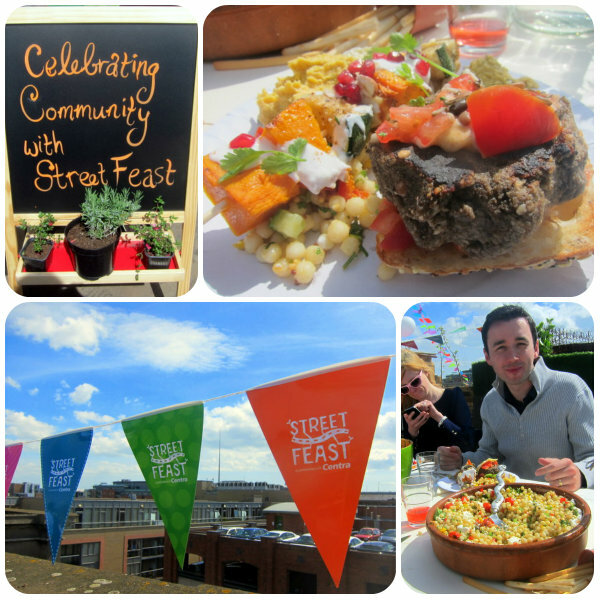 Street Feast aims to change all that. It's a lovely movement started by a group of volunteers a couple of years back, to promote and encourage a day of local lunches across Ireland on 23rd June. The idea is simple: bringing people and communities together through food, and encouraging good old fashioned neighbourliness. Supported by Centra, the events will be taking place everywhere from parks and gardens to right out on the street. The organisers describe it as 'really just a great excuse to eat great food, celebrate your local community and meet new people who live near you.' Who wouldn't want in on that action?! Or check the website to see what events are happening near you. Fun, food and friendship...doesn't this movement rock? Let the feasting commence! WOW !! Always love to be a part of street festivals :) Great pics ! What a lovely idea! I'd love to get to know my neighbours better actually, we only ever say hello when we pass each other. and such a great idea to bring neighbors closer together. what a great way to meet your neighbors! food and great music can do that. hahaha great pics Emma! You are so speaking my language with a street feast. Awesome! I totally need to do this. My apt does a lot of events, luckily! I wish we knew our neighbors. It seems so wrong to live in the same neighborhood and not know them! This looks like a great idea. This sounds fun and great way to intermingle and form some the of unity within a community, we really need something like it here. I live a small community so it seems like everyone knows everyone else. These events sound like a lot of fun and a great way to mingle. Nice blogging and very well managed blog here. Nice use of different pictures. Really, really cool! Seriously, I love the people behind this! It's on right before I come home to the Summer, so I'm going to miss it - dammit. Looks like soooo much fun! Awesome!